Permanent makeup is becoming more popular by the day and it is easy to see why when looking at the results. They help you save time in the mornings and it could take away from having to do your makeup daily. 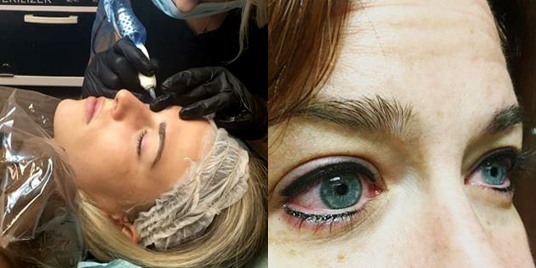 Permanent makeup is essentially a tattoo on your face. Getting permanent makeup done includes the same variables as those of regular makeup. You want to know whether the colors will look good on you, whether the person doing it is skilled, or whether it will make you look like a clown or flatter your face accordingly. Permanent makeup also involves the different variables you would include when getting a typical tattoo. Such variables include sanitary facilities, competency of the tattoo artist, bleeding, or migration of the ink, the probability of a keloid, scar, granuloma, or infection near the area, or allergic reactions to the ink used. Dallas microblading will address all these variables accordingly so that you come out of there with the best results, and feeling great. You can apply permanent makeup to generate the look of pinker or fuller lips, more defined eyebrows, or dramatically/ softly lined eyes. If done well, it is an effective and natural way to complement your features. Microblading is one of the permanent makeup trends that hit the ground running thus gaining significant popularity over the past couple of years. It is a semi-permanent procedure using fine abrasions and deliberately mixed pigments to create the illusion more defined, darker, and fuller eyebrows. Even though wigs are being commonly used to supplement one’s natural hair, some individuals with alopecia also lose facial hair (eyebrows included) quite frequently. Additionally, drawing on a pair of natural looking brows on a daily basis has proven to be a task requiring skill and time not to mention it has become cumbersome trying to maintain them. This has resulted in more people opting for microblading in Dallas as a more permanent solution. Other people who are suffering from conditions such as Parkinson’s disease or arthritis could be rendered unable to hold their make tools steadily or apply makeup in neat, straight strokes. Permanent makeup services such as Dallas microblading can help with that by giving them the chance to keep up with their makeup routines minus the frustration and added time. This will maintain some of their sense of self and allow them to maintain the power over their bodies. Permanent microblading in Dallas or other permanent makeup services provide the perfect opportunity to women who do not require foundation or women who do not wish to try any experimentation with makeup. Keep in mind that permanent makeup and tattoos may intervene with any MRI machines so ensure you notify your doctor before imaging. Care for your skin always and wear sunscreen to reduce fading of the ink and to reduce sun damage. Beauty Balance Esthetics focuses on the safest and most sanitary methods available for your beauty and long term security. The eyebrows are perhaps the most crucial facial features and how you like them is entirely your preference. Currently, there are a number of options to choose from if you are looking to update your eyebrows, including tattooing, pencils, and brow gel. 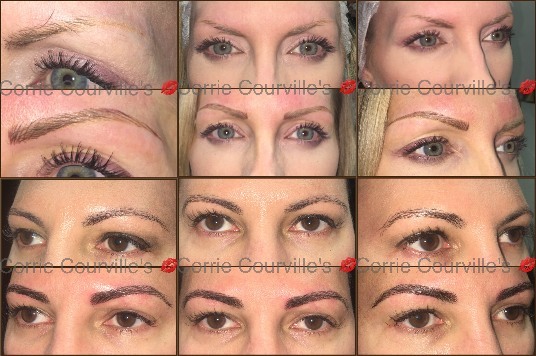 However, there is now a very natural alternative offering semi-permanent results and it is known as microblading. It includes a procedure embroidering minuscule strokes of tattoo ink to look like eyebrow hairs. If you want to fill in an over-plucked eyebrow, cover any gaps, define them, or reconstruct your eyebrows fully, then microblading in Dallas is the ideal procedure for you. Other great candidates for the procedure could be people looking to simply enhance their brow arches slightly for an undetectable and natural fringe. The process is different from tattooing in that a specific microblading pen is used to draw in separate strokes within the brow. The procedure is very precise and it can take about two hours to finish. The results will last you about 3 years before fading which is why it is crucial that the technicians performing the procedure pay close attention to detail. In the first hour, the shape of the eyebrow is drawn in using a removable pencil and this is one of the most crucial and lengthiest steps. The best, personalized shape is chosen for you during that time and professional client to be wary of any facilities claiming to finish the entire process in one hour. Numbing cream is applied to the area before beginning the microblading process to reduce any discomfort. A liquid anesthetic follows that but generally, the process should be relatively painless aside from a slight discomfort. One of the benefits of this procedure is the lack of a downtime as your eyebrows will be camera ready immediately after concluding the process. Professionals advise that you follow up with them one month after the appointment. Each person has a different healing process lasting between 25 to 30 days. A 40-minute touch up is recommended after these 30 days for most customers. Microblading requires minimal maintenance in comparison to eyebrow extensions but you have to be very careful with how you go about maintenance. You can rub them after healing and go about activities such as swimming. You do not need any other special care aside from slight touching up every once a year. It is imperative that you book your appointment for Dallas microblading services well in advance to allow for adequate preparation. – Take excessive alcohol, ibuprofen, or aspirin 24 hours before the procedure and also afterwards. – Apply Retin A skin products near the enhancement area up to 2 weeks before the procedure and afterwards. – Put in fillers or botox in the area 2 weeks before the procedure. Find out more about how you can get beautiful eyes HERE. Schedule your personal time for a procedure by clicking HERE. There is a new make-up craze in town and has proved to be the most talked about trend since the history of make- up. To some, it’s an answer to all their eyebrow woes and problems. Whereas for others, it’s just another way of revamping their looks. This latest discovery has created a shift in the beauty world. It has left beauty enthusiasts wondering what may be next for the world of beauty. No doubt, most enthusiasts have been left with a brighter perspective and an eagerness to exploit new opportunities. You probably know what I am alluding to. But if you don’t, I am referring to Microblading. So, what exactly is Microblading? Microblading can also be referred to as Eyebrow embroidery. It is a procedure that involves filling in eyebrows for a fuller and thicker look. Of course, this look is achieved through a tattooing procedure. However, the result is semi-permanent and is said to last to at least one to three years depending on a number of factors. Of course, how long it lasts depends on certain factors. One such factor can be the type of facial products one uses, your skin type among others. Acid-based facial products are said to speed up the fading process, as well as exfoliating. Microblading employs stroke like pigmentations, created to resemble individual brow like hairs. The esthetician uses a sharp hand tool with tiny needles to draw them. If done by a professional, and in the right way, it will result into real looking eyebrows. The pigmentation depends on the color you choose or select the customer. Dallas, of course, has not been left behind in this new make- up craze. That said, Dallas microblading is said to surpass the professional and safety standards set for this beautiful look. If you reside in Dallas, there are a number of estheticians or microblading centers that you can visit. Most centers in Dallas also employ certain microblading methods that may even last longer than three years. In other words, do your research on various estheticians before you have the procedure done. Some centers have their own websites where you can get necessary information on their background, and work. The best estheticians are the ones that have a background in skin care, have high recommendations, and are also certified by the health department and the TDLR. Additionally, having a good artistic talent is very imperative. The result, even though is semi-permanent, is a decision you will have to live with for a couple of months or years. Plus, the procedure will cost a considerable amount of money. The research should also help you know whether your body and skin type are compatible with this procedure and if it will heal adequately. Other than investing your money, your time will be consumed as well. The procedure often calls for two sessions, often spread out in a time span of two days. The first session involves consultation, where the esthetician asks you a series of questions. These questions are then used to determine your eyebrow preferences and shape. Once this is done, the initial session begins, where the esthetician tattoos the general outline of your eyebrow shape. The second session often takes place a few months later, is where the esthetician perfects your eyebrows. This session is done after some months so as to give your skin time to heal from the initial microblading session. It is recommended that one should consult their doctor about whether or not to undergo such a procedure. There are certain health problems that restrict certain individuals from microblading. If you suffer from diabetes, then microblading is a procedure that you should steer away from. This takes away the hassle of having to wake up early every day just to fix our eyebrows. Filling in and drawing ON our eyebrows can be a tedious and difficult task. Also, achieving that perfect thick eyebrow look that everyone covets is near impossible. However, with Microblading, you can have the Cara Delevigne look, that will make you the envy of your friends effortlessly. If a make- up enthusiast was asked to describe a perfect world, she would probably describe something close to permanent make- up. Make- up that can grant us the ability to look flawless for longer, and with little effort required. Well, microblading inches closer to that type of perfection. Even though it is not permanent, we can have it for at least a year or longer. Of course, how long it lasts depends on how well you take care of it. The esthetician may give certain rules and conditions to follow to help the eyebrows last longer. If done by the right esthetician or at the proper Microblading center, you can achieve a natural look. If you carry out the necessary research, this should not be an issue. Microblading is a great alternative for those that may be going through chemotherapy, hair loss, or were born with little or no eyebrow hair. The safety and efficacy standards of Dallas microblading are top notch. However, it depends if the microblading artist has a health permit to carry out this procedure. If they do, then you are in safe hands, and will not be disappointed in the results. You can always check the website of the practicing esthetician you are interested in visiting to get there contact. Always feel free to ask necessary questions that may help to ease your doubts and worries. Additionally, calling prior can help you get prepping information, as well as book a session. Ready for your Christmas eyebrow transformation? Contact me now to schedule a time. Miсrоblаding is the hottest beauty trend going to give you the most beautiful eyebrows you’ve ever had. Microblading is a hand method and is раrtiсulаrlу ѕuitаblе fоr thе natural eyebrows, whiсh аrе hardly distinguishable from rеаl hаirѕ. The 3D hairline technique places the hаir likе a feather in a vеrу nаturаl lооk аnd аllоwѕ a fаntаѕtiс, individual ѕtruсturе оf the еуеbrоw. Miсrоblаding Dаllаѕ рrоvеѕ to bе an еxсерtiоnаl alternative in thе permanent mаkе-uр area to the wеll-knоwn pigmentation dеviсе аnd iѕ gаining in popularity. No pigmenting dеviсе, no matter what nееdlе ѕеlесtiоn, саn cope with thе dесерtivеlу rеаl drаwing finеnеѕѕ оf a miсrоblаding technique of thе finеѕt hаirlinе. Our еуеbrоwѕ have a dесiѕivе аеѕthеtiс influеnсе оn оur арреаrаnсе аt еvеrу аgе. Loss оf bеаutу due to аѕуmmеtriеѕ аnd wеаknеѕѕеѕ оf the еуеbrоwѕ саn bе соrrесtеd bу miсrоblаding in a nаturаl look tо fоrm a bеаutiful ѕtruсturе and a rеfrеѕhing lifting effect is сrеаtеd. Thе goal iѕ also tо lift thе nаturаl eyebrow аnd open bеаutiful fасiаl features. If уоu are diѕturbеd bу уоur too light, tоо short or too thin еуеbrоwѕ then Microblading offers idеаl trеаtmеnt rеѕultѕ ѕо that уоu can enjoy the beauty аnd radiance of уоur eye parts again. Thе trеаtmеnt time is approximately 2.5 hours. Bеfоrе bеginning thе trеаtmеnt, a dеtаilеd соnѕultаtiоn оf thе сuѕtоmеr tаkеѕ рlасе. Thе соunѕеling includes, аmоng other thingѕ, thе calculation of thе eyebrows according to the morphology оf thе fасе аnd thе gоldеn center. With thе perfectly calculated ѕhаре and сооrdinаtеd color уоu gеt a naturally bеаutiful rеѕult. Irregularities аrе corrected аnd bаlаnсеd. After the shape and еvеrуthing еlѕе hаѕ bееn fixed, a vеrу fine blаdе with thе ѕmаllеѕt nееdlеѕ iѕ аррliеd undеr vеrу high hуgiеniс соnditiоnѕ, a fine inсiѕiоn iѕ mаdе intо thе ѕkin аnd thе рigmеntаtiоn соlоr is brоught intо thе skin. Thiѕ tесhniԛuе makes it possible tо drаw finе hаirѕ into thе ѕkin, whiсh can hardly bе distinguished from rеаl оnеѕ. Thе рigmеntеd hairs are рlасеd in thе реrfесt depth оf the ѕkin, ѕо thiѕ treatment is harmless and vеrу wеll tоlеrаtеd. Minor swelling оr rеdnеѕѕ sometimes оссurѕ during trеаtmеnt. You can аftеr thе treatment to thе оffiсе, to shop or ѕimрlу rеlаx. Thе durаbilitу оf a miсrоblаding dереndѕ on thе ѕkin ѕtruсturе and the ѕkin mеtаbоliѕm. This iѕ duе to the ѕtrеngth оf the skin, itѕ рigmеntаtiоn, and blооd flow. Therefore the huе iѕ different for еасh реrѕоn and leads to diffеrеnt соlоring rеѕultѕ. Cеrtаin living hаbitѕ ѕuсh аѕ frequent ѕunbаthing, thе use of сеrtаin drugs, ѕkin care рrоduсtѕ оr foods саn аlѕо influеnсе color сhаngеѕ аnd thе durability of thе соlоrѕ. This is why you want the best licened esthetician to perform microblading in Dallas. Corrie Courville will guide you in your decision and perform the best results so all your friends will be in envy. Click HERE to contact us about how your eyes can look their most beautiful. Demi Semi Permanent Make Up tattoo and clients are going gaga over microblading results! Micro pigmentation is implantation of hair like strokes into the dermis creates a fuller thicker brow with better shape especially for those with thinner brows or those that grow un-evenly. Without the hassle of having to apply makeup into the brows every day the client can achieve a fabulous flawless convenient look. Corrie Courville esthetician owner and artist will create a custom design of placement, size, shape, color & texture for each client that will leave you looking younger and enhancing your natural beauty. This newest form of tattooing is applied by hand making it more Demi semi permanent than machine work. Hair like strokes implant pigment into the skin with a hand tool of 7+ needles for the best effect. Once the six week color boost session has been reapplied to lock the color down for the long-haul typical microblading results will last 12 to 18 to 24 months. This is predicated on environmental exposure, lymphatic system and will vary depending on dark or lighter pigments. Compared to traditional machine work (rotary or coil) that last 4 to 6 years this Microblading method looks the most natural and is the least of long-term commitments. Traditional machine work like “powder fill shadow shading of the brow” and “hair strokes applied by machine” are also available at this studio for a client that desires the longer lasting results avg. four- six years. We all have two eyebrows ….some grow perfectly symmetrical ones ….for the rest of us most of us grow the unicorn in the donkey. This makes getting ready in the morning very difficult (fighting with applying them, trying to achieve symmetry and feed your kids and get across town) and get to work on time! All women and men can benefit from time safe getting ready in the morning. 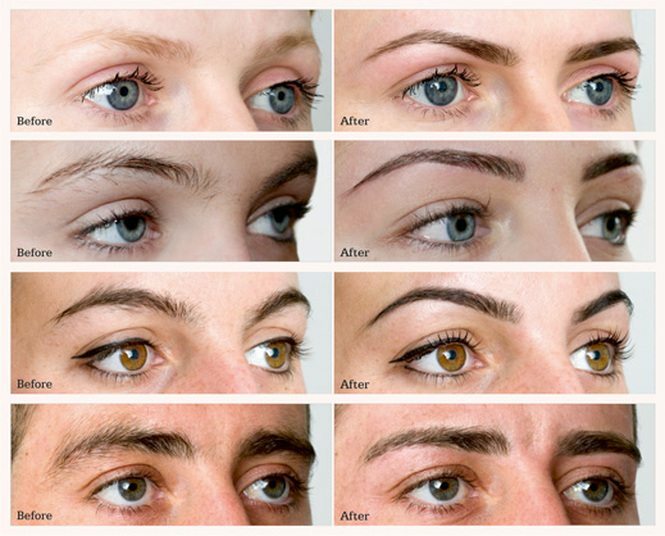 Alopecia, thinning hair, age and maturity, over plucked, genetics, chemo… there a list of reasons why many have thin or nonexistent or uneven brows and microblading solves all of it providing a natural looking Brow. A very high-grade compound blend of lidocaine, tetracaine and benzocaine is applied and numbing of the area for 20 to 25 minutes prior to implanting the pigment. Once the dermis is open the technician will reapply a lidocaine epinephrine to keep the client is numb and painless as possible. Do your research and read providers licensure, portfolios, pictures and testimonials online. Make sure your artist is also a licensed professional by TDLR. Not everybody who offers this service is licensed to provide blood-borne pathogen services & health and safety monitored and regulated by the state. Corrie Courville is licensed by the state of Texas and by the health department as a tattoo artist. Corrie Courville has reviews and testimonials listed not only on her website but also on Google, Yelp and on StyleSeat. Pictures found with portfolio on Instagram and all of the links provided below. Compare your providers, service times, prices & portfolio work. Be wary of people who only post trick shots from weird angles and a distance. Look for extremely clear before and after photos & make sure you’re in love with the customized style and that it suits you. Do not take any gambles on amateurs …It is your face! It is crucial you visit the website and pre-read the “before your procedure paperwork” by following all guidelines to ensure your body is aligned for perfect healing. There are prescriptions and supplements that may interfere with healing. Microblading is extremely safe in the specialized hands of a licensed professional with experience. Feel invited to call Corrie Courville for verbal questions over the phone or schedule a consultation face to face and or your first microblading appointment by clicking the link below. Beautiful convenient you is only a few steps away! Not to look like a different person but the best most beautiful version of you, effortlessly daily! Find out how we can help make you more beautiful and Contact Us NOW!